My family clipped and scrap-booked endless numbers of birth announcements, wedding announcements, obituaries and other items from newspapers throughout the 20th century. But here's one I came across on Newspaper.com that probably wasn't considered a family highlight worth saving for posterity. It's from the July 18, 1914, edition of The Morning News of Wilmington, Delaware. My great-grandmother, Greta Miriam Chandler, would have just turned 20 years old when this happened. 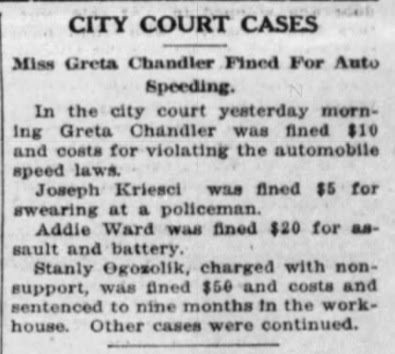 That $10 fine for speeding in 1914 was no laughing matter. Ten dollars then is the equivalent of about $243 today, so I think it's possible that her driving privileges were curtailed by her father, Lilburn Chandler, following this incident. In fact, while my Mom isn't around to confirm or augment this tale, I don't think my great-grandmother did much driving at all after this. As of this date, I have received three speeding tickets during my lifetime, two in Pennsylvania and one in South Carolina. I'll bet she was doing at least 15 mph. Hellion. By the way, on August 21 of this year, Great-Grandmother Greta would have been 45,000 days old.